Ryan Bader is riding high after knocking out Fedor Emelianenko at Bellator 214 last weekend (Jan. 26, 2019) and now the promotion’s first-ever “champ-champ” is looking toward the future. Bader, 35, has found his stride since leaving the UFC as a free agent back in 2017. “Darth” now hold both the promotions light heavyweight title and the heavyweight strap. He hopes to become the first double champ in MMA history to actually defend both titles. Time will tell. 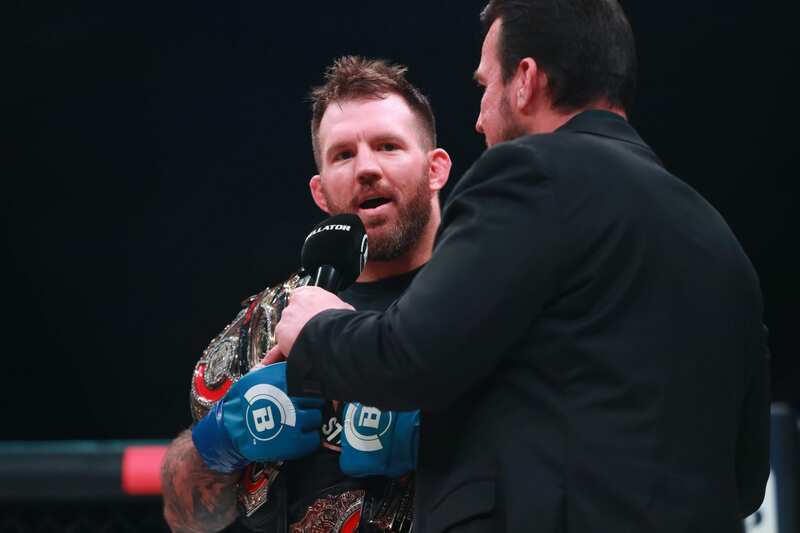 In order for Bader to defend both titles, he would need to reign with the Viacom owned promotion and forego free agency altogether. That, however, is exactly what the sports newest “champ-champ” is thinking about doing. “No, I want to do a new deal now,” Bader said on The Ariel Helwani MMA Show earlier today. “I have one fight left, I have the champion’s clause or whatever, in my contract. Two-division champion, light heavyweight belt, heavyweight belt; if they want me to do something in particular, defend the heavyweight belt or whatnot. Let’s get a new deal done. I have been having a great time with Bellator and I want to stay there. But that has to happen first,” he said. Bader came under some criticisms from fans for “not being able to get the job done in the UFC.” While it may be true that Bader never earned a 205-pound title shot in his eight years with the company, he never really got much of a push from the promotion either. All he has done since leaving the UFC is go 5-0, collect two championships, and win the World Heavyweight Grand Prix. He has done all that while taking very little if any damage. So it isn’t surprising that “Darth” is happy with his current employer. “It’s a selfish sport and you are in business for yourself. Obviously, I have been treated well and I think I am going to be treated very well after this with Bellator. I haven’t really had those thoughts,” he added, regarding a UFC return.